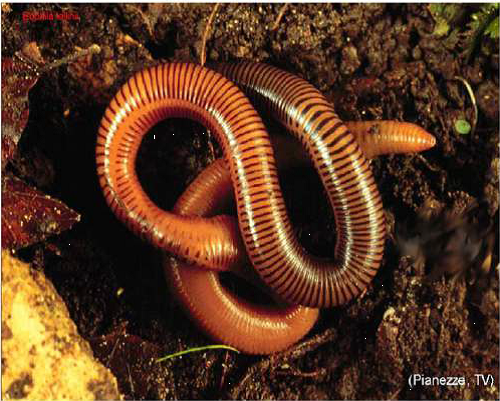 A new Italian earthworm morphologically close to the similarly large and anecic Eophila tellinii (Rosa, 1888) is described. Distribution of Eophila crodabepis sp. nov. extends over 750km2 from East to West on the Asiago Plateau and Vittorio Veneto Hills, from North to Southon mounts Belluno Prealps (Praderadego and Cesen), Asiago, Grappa and onto the Montello foothills. This range abuts that of Eophila tellinii in northern Friuli Venezia Giulia region. Known localities of both E. tellinii and E.crodabepis sp. nov. are mapped. mtDNA barcoding definitively separates the new western species from classical Eophila tellinii (Rosa, 1888).